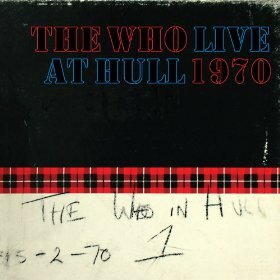 One is aware of Pete Townshend, Roger Daltrey and John Entwistle (guitar player-songwriter, vocalist and bassist of The Who, respectively), but really it is the thundering of drummer Keith Moon on “Heaven and Hell” that’s most apparent on the opener from Live At Hull 1970. This concert happened the night after the famous Live At Leeds show, an album that has seen quite a few releases. (A deluxe box set, which included both of these shows, was released a few years ago.) If this second show is better and deserves its own 2-disc release, it’s not for me to reason (though a technical error of John Entwistle’s bass not being recorded on the first four tunes sees the backing tracks from Leeds lifted and placed into this recording). Tunes like “I Can’t Explain” (again Moon is just on fire here) and a crazy John Entwistle bass-driven “Fortune Teller” explodes, but its mainly the songs from Tommy, the band’s infamous rock opera, that are featured in this 20-song set. “Overture” a full-on Pete Townshend guitar power-chord fandango, a clear-as-a-bell, sweet “1921,” a positively Hendrix-ian (or did Hendrix get what he did from Townshend?) “Sparks,” an instrumental where we hear the true interplay between the trio that was Entwistle, Moon and Townshend at their most incendiary. Daltry’s golden throat carries his band’s cover of “Young Man Blues” (made famous on Live at Leeds) as it does a true rockin’ version of “My Generation,” complete with that famous high-end Entwistle growling bass lead and a wailing growling ending of Moon chunking the band along.